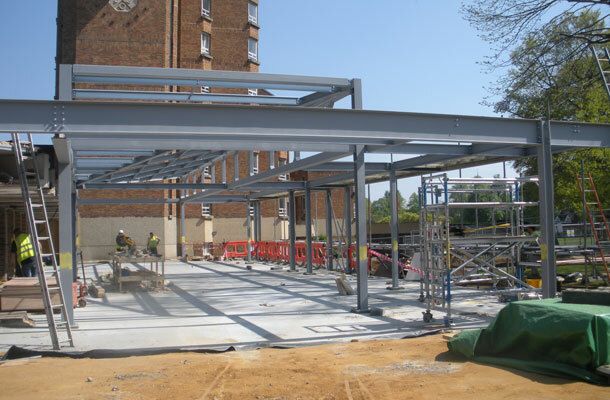 Construction work is underway on the 2150 sqft extension to the seminal 1970’s ‘New House’ Dining Hall at Charterhouse by Richard Gilbert-Scott. The £600,000 extension is part of a £1.1m remodelling project, which accommodates a new dining hall for day boys in ‘Fletcherites’ House. The new facility will be opened for the new 2011-12 academic year. This is one of three commissions for Charterhouse; the others being a new Chemistry faculty and an extension to the Queen’s Sports Centre. Our involvement with the School began with a successful invited design competition in 2010.